The velocity of change in cyberspace should make “operational surprise” not a surprise at all, but a condition that is expected and must be managed. -- Report of the Defense Science Board, 2008 Summer Study on Capability Surprise (Vol 1). Src: Report of the Defense Science Board, 2008 Summer Study on Capability Surprise (Vol 1). Secondly, cybercrime is easy: there is extensive documentation on hacking and virus writing freely available on the Internet, meaning that no sophisticated knowledge or skill is required. These are the two main factors which have lead to cybercrime becoming a multi-billion dollar industry, truly a self sustaining eco-system of its own. The most sophisticated actors have the ability to alter our hardware and software along the global supply chain route, conduct remote intrusions into our networks, establish the physical and technical presence necessary to re-route and monitor our wireless communications, and plant dangerous insiders within our private sector and government organizations. The actors that currently have all of these capabilities — which is a finding that is distinct from whether and when they are using them — include multiple nation states and likely include some organized crime groups. In the cyber realm, the technical positioning an adversary requires to steal data typically provides them with the very same access and systems administrator rights that could be used for destructive purposes. As a result, our adversaries' use of Computer Network Exploitation — the ability to monitor our networks and steal our secrets — might simultaneously provide them with pre-positioned capabilities to conduct Computer Network Attack — the ability to deny, disrupt, degrade, or destroy our information, our networks, and the infrastructure services that rely upon them. I'll admit it, this is one of my favorite information security quotes. It is important to educate people, but we have to realize human behavior will always change much more slowly than the threats do. -- John Pescatore, VP and Distinguished Analyst with Gartner, Inc.
Microsoft has recently released an update to their Security Development Lifecycle meant to address the need for security in the agile development process. The document defines Microsoft's process, which is termed Secure by Design, Secure by Default, Secure in Deployment, and Communications (or SD3+C). The section below describes the list of products and services that are required to adopt the SDL process. This seems to cover basically every piece of software that Microsoft makes. What Products and Services Are Required to Adopt the SDL Process? Any software release that is commonly used or deployed within any organization, such as a business organization or a government or nonprofit agency. Any software release that regularly stores, processes, or communicates PII or other sensitive information. Examples include financial or medical information. Any software product or service that targets or is attractive to children 13 years old or younger. Always online. Services provided by a product that involve a presence on the Internet (for example, Windows® Messenger). Designed to be online. Browser or mail applications that expose Internet functionality (for example, Microsoft Office Outlook® or Microsoft Internet Explorer®). Exposed online. Components that are routinely accessible through other products that interact with the Internet (for example, Microsoft ActiveX® controls or PC–based games with multiplayer online support). Any software release that automatically downloads updates. Functionality that parses any unprotected file types that should be limited to system administrators. Any release that contains ActiveX controls. Any release that contains COM controls. Src: Security in 2013 and Beyond | Gartner, Inc. The entire article is full of insightful comments by many key players in the information security space. Absolutely worth the 5-10 minutes it will take you to read it, even if you find yourself disagreeing with some of the opinions. The problem for law enforcement and intelligence today is not the lack of information; it is the deluge of it. -- Ron Deibert, director of the Citizen Lab, a principal with the SecDev Group, & cofounder of and principal investigator for the Information Warfare Monitor. Many businesses, governments and individuals are still unclear of the true value of data and where it resides and who has ownership is even less clear. We need to be better at controlling and managing data and understand the expectations of the data owners and providers. For example, if we give personal data to identify and validate ourselves – this data is only required for a short period of time and could then be destroyed. -- Professor Howard A. Schmidt, CISSP, president of ISF. We don't need to know who's doing it, just what it looks like at an earlier phase, so we can alert our institutions and prepare them on what to look for. -- Doug Johnson, Senior Policy Analyst at the American Bankers Association. No one could credibly deny that IT has a significant responsibility for security and privacy, but care should be taken to distinguish enablement from execution. The fact is, IT alone cannot solve the problem. -- Ted DeZabala, author & national leader of the Security & Privacy Services practice at Deloitte & Touche LLP. We still have 18th century laws looking at 21st century technologies – that needs to be changed. -- Howard Schmidt, ISF President & CEO. No individual business is facing huge losses necessarily, but collectively we are facing just unimaginable losses, but nobody is willing to pay the cost up front for what is necessary to solve the problem in the longer term. Data loss is to information security as patient mortality is to medicine. 'Extremely rare' has to mean 'close to never' vs. 'not often.' -- John Pescatore, Vice President at Gartner Inc.
Cyberspace is its own medium with its own rules. Cyberattacks, for instance, are enabled not through the generation of force but by the exploitation of the enemy’s vulnerabilities. Permanent effects are hard to produce. The medium is fraught with ambiguities about who attacked and why, about what they achieved and whether they can do so again. Something that works today may not work tomorrow (indeed, precisely because it did work today). Thus, deterrence and warfighting tenets established in other media do not necessarily translate reliably into cyberspace. Such tenets must be rethought. -- RAND Corporation report "Cyberdetterance and Cyberwar"
"Encryption is a fantastic way to assure the privacy of live data, but is not suitable for the protection of end-of-life data," says Ben Rothke, Senior Security Consultant with BT Professional Services & author of Computer Security: 20 Things Every Employee Should Know. Encryption's weakness is that the keys used to secure the data may be compromised. Even if the 256-bit Advanced Encryption Standard (AES) is used, which is unbreakable using current technology; data can be compromised if the user chooses a weak passphrase to protect the data, or if the key was not properly destroyed. Some have suggested that encryption and then losing the keys is a method of destruction. But in speaking with those who have forensic labs, they note that there are ways of getting keys, as well as cracking keys on lesser levels of encryption. Given that, encryption should be used as a security mechanism, not as a destruction tool. The next world war could begin in cyberspace. Sun Tsu’s teaching is clear. Security must rely on strong defenses even when no attacks are evident. -- Richard Stiennon, founder of IT-Harvest. Asking the name of your pet really does not meet the spirit of two factor authentication. -- Stephen Nortcutt, President SANS Institute. Tom Liston, senior security consultant & malware analyst for Inguardians, comments on a recently announced loophole that allows HIPAA-covered entities to dispense with breach notification if the harm threshold is not met. The harm threshold is met if the breach poses "significant risk of financial, reputational or other harm to [an] individual." Well, duh! I don't find this surprising in the least. Anymore, malware has a business model... and nothing interferes with that model more than having your malware *removed*. How much damage can ONE infected USB flash-drive do? If it's infected with Conficker-D and your IT systems are not appropriately maintained and patched (council was still running Windows 2000, requested an update to Windows XP). In addition to being out of commission for a week, "further shutdowns followed when the network was reinfected twice in the next week, and all terminals had to be rebuilt or replaced." Data can either be useful or perfectly anonymous but never both. For almost every person on earth, there is at least one fact about them stored in a computer database that an adversary could use to blackmail, discriminate against, harass, or steal the identity of him or her. I mean more than mere embarrassment or inconvenience; I mean legally cognizable harm. Perhaps it is a fact about past conduct, health, or family shame. For almost every one of us, then, we can assume a hypothetical 'database of ruin,' the one containing this fact but until now splintered across dozens of databases on computers around the world, and thus disconnected from our identity. Reidentification has formed the database of ruin and given access to it to our worst enemies. The trouble is that PII is an ever-expanding category. Ten years ago, almost nobody would have categorized movie ratings and search queries as PII, and as a result, no law or regulation did either. carry out all online banking activity from a standalone, hardened, and locked-down computer from which e-mail and Web browsing is not possible. The article discusses the recent increase in real-time fraud in which hackers can negate the security advantages of token-based authentication devices by stealing the access credentials and using them in real time. Rich Mogull, founder of Securosis, shares with Macworld readers the elaborate (but in my view entirely justified) setup he uses to browse the Internet in a secure fashion. For the average user, this setup would definitely be too much. However, if money or fame makes you a likely target, this setup provides some of the best protections that technology can provide today. My chosen profession requires a tad more paranoia than is mentally healthy for the average user. Still, these techniques are relevant for anyone concerned about security. At a minimum, I recommend dedicated password management, a dedicated Web browser or SSB [Site Specific Browser] for banking, and perhaps a VM [Virtual Machine] for those occasional trips to the darker edges of the Internet. In my own practice, I use many of the same techniques described by Rich; after reading this, I will start implementing the rest. was written specifically to crawl for, and to steal intellectual property. What was most unusual about the malware is that could crawl different file types -- Excel, PDF, for instance -- for intellectual property to steal, Hoglund says. Then it would encrypt and send the stolen information to its own servers. Some malware has attacked researchers' hosts and networks while other variants can detect if they are running in a virtual machine, a common practice to isolate and study malware. The same percentage of them fall for scams and malware in online social networks as the percentage of their parents who fell for email scams and the percentage of their grandparents who fell for real world scams. Despite the changes, they are still just human beings after all. -- John Pescatore, VP Gartner Inc. It's time for the cybersecurity community to accept the uncomfortable truth that DDOS is what people do when they hate each other. In the past, they used to trade hate mail; today, they trade DDOS attacks. Thanks to the Internet, today there are plenty of other ways for concerned and patriotic citizens to show their excitement about a war their country is fighting. DDOS is the new poetry. Stop assuming that systems are secure unless demonstrated insecure; start assuming that systems are insecure unless designed securely. -- Bruce Schneier, Chief Security Technology Officer of BT. Those that have been in the information security long enough know Marcus and his reputation as a skeptic. I have to say that I was very impressed with Marcus' quote given that it was provided during an interview with Patrick Gray of the Risky Business Podcast. A security person would say we would protect the data at all costs. A risk-oriented person would say let's try to quantify the business impact of this data and then protect the data that is absolutely critical to our operations. -- Rob Whiteley, Vice President and Research Director at Forrester Research Inc. This article is a worthwhile read as it addresses things that IT and Security staff can/should and can't/shouldn't try to control. De-provisioning users is one of the most important things an organization can do yet it continues to be one of those things people simply don't think is important enough...until they become a victim. -- Mark Weatherford, CISO for the State of California. The security mindset involves thinking about how things can be made to fail. It involves thinking like an attacker, an adversary or a criminal. You don't have to exploit the vulnerabilities you find, but if you don't see the world that way, you'll never notice most security problems. -- Bruce Schneier, Chief Security Technology Officer of BT. I recently came across this password strength checker from Microsoft. While giving users feedback about the relative strengths of their passwords is a good way to help them choose good passwords, I also wanted to illustrate how current password strength checkers often fall short of their goals. Case in point, both "aGoodL0ngPa$$w0rd" and "$3cretPa$$word" were rated as best passwords. Yet both of these would be easily guessed by a password cracking program supporting leet speak. Design decisions should anticipate changes over time to environmental and system factors, including security. Perceptions often lag reality, and it can be costly to weigh your options or implement changes only after security threats become too great to ignore. Built-in security is cheaper and more effective than trying to retrofit it after the system has already been placed into operation. Once the last brick has been placed, infrastructure design decisions have been 'cast in stone,' and like the aqueducts, are built to last and hence not easily changed or replaced. The CSO Online article draws many good parallels between the significance of the roman aqueducts' designs and the current efforts to modernize the power grid into a "smart grid". In this fog of [cyber] war, anonymity means stealth, deniability and lack of options to respond. If the US cannot respond, its deterrence fails. Deloitte's new report entitled "Intensive Risk, Elusive Value: A Risk Intelligent Executive's Guide to Security and Privacy," is targeted at board members and executives who might be wondering "Could this happen to us?" Here are a few interesting quotes to get you motivated to read the full document (see link below). Data and information, the crown jewels of your enterprise, can no longer be defended in the manner of a moated castle, with security measures applied around the perimeter. Today, the moat has been drained, the walls toppled, and the assets scattered across the countryside. Business as usual is business at risk. Logging, measuring and digesting information is vital to the evolution of our security approaches. It's allows us to answer the Ed Koch catchphrase "How'm I doing?". If you don't know how you're getting attacked (and how effective you are against those attacks), you can't change your defense strategy (or worse, your defense philosophy). Every business model that exists in the legitimate business world is replicated in the criminal world, to the point that we see malware with service level agreements. What the [security] industry has generally missed is that it is the business information that should be protected, and not the physical assets that is used to store, process, or transmit the information. -- Gerry Chng, partner of advisory services at Ernst & Young. The disconnect seems to arise from the fact that IT is typically managed by technologists, who place emphasis on relying on technology to solve security issues. Over the years, we have seen the obsession with hype on technology, where IT tries to secure the infrastructure and tangible assets, [such as] data centers, servers [and] databases. Very rarely do good things happen when technologists try to make public policy *or* when politicians try to dictate technology. -- John Pescatore, VP of Gartner Inc.
As an information security professional, I always look for ways to be of assistance to others about the security and privacy of the data entrusted to them. This post is about exercising such an opportunity and in a small way, helping make a difference. On July 29th, as I was following up on a story that flashed across my Twitter stream about 30 certified employees of a school district finding themselves victims of ID theft, I found something that should not have been there. While looking for more information about the school district, I used a targeted Google search; it was a simple one, looking for pages containing the word 'certified.' While there were many search results, one in particular caught my eye: an Excel spreadsheet that appeared to contain Personally Identifiable Information (PII) including names, addresses, phone numbers, and social security numbers . Worse, it had been indexed by a major search engine, which meant that its contents had been cached for easier viewing, even after the file would be removed. I placed a called to the school district right away and left a voicemail for the CIO. Within 20 minutes someone from the office had called me back. I shared with them what I had found and advised on short-term steps they should take to mitigate the problem. While it may be tempting to lay blame for failing to properly safeguard sensitive data, this is not the purpose of this blog post. Instead, I wanted to share with the information security community and students that we can make a difference, even outside of business hours. In this case, I helped the school district identify one data leak. Was that spreadsheet the one used by fraudsters? It is simply too early to tell; the investigation is ongoing. If you see something that is out of place, or poses a potential security/privacy risk, tell someone. It could help prevent 30 more people from becoming victims of ID theft. Let users dictate enterprise security needs. He went on to give an analogy that I am very familiar with, that of campus sidewalks: the planners place sidewalks and grass; students create their own paths through the grass (usually the most direct route); planners have to put roadblocks (chains, planters) to keep students off the grass. He said, "security companies will change from creating infrastructure boundaries to infrastructure resilience. If we can build security correctly, we make things easier, not harder." John Ericksen, Chief Operating Risk Officer at PNC, described his responsibilities as having oversight of risks stemming from: operational risk governance, data analysis, external events, strategic risk elements, information security, privacy, business resilience, and financial intelligence. For the banking sector, John considers the CRO's responsibility to be "to forge a view of these risks that transcends the bank's individual departments to enable quick decisions based on an enterprise-wide view of exposures" and being able "to add the right nuances to the information so you can have a thoughtful conversation about it with other staff." how it's collected, its integrity, what it's being used for, its accuracy and making sure the right data management systems and technology are in place to make informed decisions based on portfolio, geographic and customer views. Data is now the gold, the silver and diamonds of the online world and criminals see it as a low-risk way to steal money without going anywhere near the crime scene. The majority of Twitter users don't mind sharing their tweets (i.e. their Twitter updates) with the rest of the world. After all, sharing ones thoughts/actions is at the core of social networks like Twitter, Facebook, MySpace. However, what users often don't realize is that in aggregate, their tweets paint a picture about who they really are. Take for example those who tweet about hating their jobs. Using the search feature in Twitter, it is possible to gather scores of users who have recently tweeted on their negative feelings about work. This information is useful in the hands of someone looking to make contact with an insider, usually for nefarious purposes. Another aspect of one's public twitter stream is whether (or in some cases how often) someone has fallen for a scam on Twitter, be it a phishing scam that they simply re-tweeted or a click-jacking attack that suddenly floods one's followers with tens or hundreds of dangerous tweets. Let's explore this item a little further. Recently, several users fell prey to a scam promising to increase their number of followers. 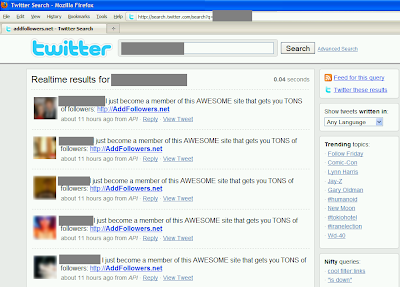 When they clicked on the link promising "tons of followers," users were asked for their username/password. This allowed the scammers to then use that account to spread their message onto more people. The real danger behind such lapses in judgment, giving another site your (Twitter) credentials, comes from what it says about the victim. By monitoring patterns of behavior, attackers can zoom in on easy prey who appear to engage in a pattern of risky behavior by clicking dangerous links or providing sensitive information. Worse, if that person is one of your employees, attackers are likely to be able to extract username/passwords from the unsuspecting user again. How confident are you that one's Twitter password isn't also their password for work email, bank account info, etc? The article also reports Pironti as cautioning that a single-minded focus on "security by compliance" will result in more lapses of security as adversaries shift to more effective and damaging attacks. It is not easy to find metrics for security goals like security, trust and confidence. The main reason is that security goals are “negative deliverables”. The absence of incidents for an extended period of time leads to think that we are safe. If you life in a town where neither you nor anyone you know has ever been robbed, you feel safe. Incidents prevented can’t be measured in the same way a positive deliverable can, like the temperature of a room. As NIST advises, organizations must add “defense-in-breadth” to their strategy mix. While Defense-in-depth focuses on the operations phase of the systems development lifecycle, defense-in-breadth covers the entire lifecycle. Thanks to the CyberWarfare Forum Initiative for bringing this article to my attention. Back in the day, watching the Dominos pizza delivery office closest to the White House in Washington DC was an information leakage path. Social network sites are the same thing - lots of worry in the military about loss of Operations Security because of all the tweeting and Facebook posting going on by active military and their families. -- John Pescatore, Vice President at Gartner, Inc.
How many of our systems have interconnections to other systems that have weaker security? If so, remember that your ultimate level of security is that of the weakest link. This is a story about an executive, in this case the CEO of Twitter, whose Gmail account gets compromised (domino #1: password reset), which leads to leakage of corporate sensitive information that was stored with Google Docs. The intruder then covered his tracks so that the account owner would not notice (domino #2: reset password back to original by correctly guessing the CEO was using a single password for multiple accounts). The same warning are applicable for bank accounts, phone records, insurance contracts, health records. Any account with sensitive information which uses a weaker account (e.g. most webmail applications) as a backup is likely to be a target of attackers looking for fresh prey and easy access to documents. Hacking systems - the thrill of the illicit, penetration, and the (slight) chance of getting caught - is a very self-reinforcing behavior. It's a paradoxical form of adrenaline addiction: the attacker is hooked on the rush, but sociopathically hides behind the safety of anonymity. It's not hard to see why a lot of hackers find it very hard to quit once they get started. -- Marcus J. Ranum, CSO Tenable Network Security Inc. There is always a hope in security circles that threats such as class action lawsuits or 'downstream liability' will cause a light bulb to go off in boards of directors' heads and they will say 'Aha - information security is important, increase the budget, promote the CISO!!' In reality, when boards hear 'liability' they tend to mostly make sure that the corporate Directors and Officers Liability insurance coverage is sufficient. The actual business damage of incidents is usually the bigger driver for action by boards of directors. -- John Pescatore, Vice President at Gartner Inc., writing about Aetna being named in a class action data breach lawsuit. "Why in the hell are you bothering with testing code that is already in production?" was reportedly asked by a CIO, upon learning of newly discovered vulnerabilities in their production system. This article written by Kevin G. Coleman, Strategic Advisor with the Technolytics Institute, provides high level comments on the current state of information security and the relation to cybercrime and management. You get the call - a computer is acting strange, malware is the likely suspect. After recording appropriate activity logs and ensuring data is safe, you proceed with the disinfection: wipe the OS and reinstall from a clean image. If you performed the procedure above, your machine may still be infected. The reason? The malware may have rooted itself deeply into the hardware itself, the BIOS, and not simply residing on the drive. This is a fascinating and developing area of active research (both by hackers and security researchers such as those at Core Security) and a story that all information security professionals should be aware of. Next time a machine is acting strange, wipe the OS and reinstall, but only after you have also flashed the BIOS. As a faculty having taught programming classes for many years, I have stressed the value of writing good code, with the requisite error checks. Some languages like C/C++ need to be compiled, and over the years, compilers have been augmented with the capacity to make "smart" decisions about the source code, usually to improve execution speed or warn of dangerous omissions ("you did remember to initialize that value, right?"). Brad Spengler, a security researcher, has created an instance of code where the compiler's "smart" logic actually degrades the overall security of the resulting binary by introducing a vulnerability that until now seemed un-exploitable. After reading the SANS ISC post below, you might just be right to claim that it was the compiler's fault: "the compiler will introduce the vulnerability to the binary code, which didn't exist in the source code." A someone who has helped grow generations of students into programmers, the suggested fix is not acceptable as it puts the burden on the programmer to know how the compiler will optimize the code. A "smart" compiler should not penalize a programmer for being extra careful with his/her code. We are more than just the strict sum of a few pieces of information that may point to us. Consider a zip code, first name, and birth year. If you look at each of these separately, it would be hard to say you can link each of them to a specific individual. However, if you look at the three items in combination, you could very well be able to identify a specific individual. Especially in more sparsely populated geographic locations. So, does this combination of three items, as a group, represent PII? It often takes just two pieces of information to be able to identify a specific individual. Once identified, finding out more information about that individual is trivial, and the stuff that criminals' dreams are made of. Rebecca Herold, The Privacy Prof, blogging about the privacy threats of data aggregation, i.e. when it is possible to aggregate individual pieces that are not private to form a picture that can uniquely identify somebody. only 3% [of CEOs] cited malicious hackers as the top threat for their company's data security--about a fifth as many as the lower level employees who cited cybercriminals as the most important threat. Cloud computing is a model for enabling convenient, on-demand network access to a shared pool of configurable computing resources (e.g., networks, servers, storage, applications, and services) that can be rapidly provisioned and released with minimal management effort or service provider interaction. This cloud model promotes availability and is composed of five essential characteristics, three delivery models, and four deployment models. Essential Characteristics are listed as: on-demand self-service, ubiquitous network access, location independent resource pooling, rapid elasticity, and measured Service. Deployment Models can be one of: private cloud, community cloud, public cloud, hybrid cloud. It is now a common mantra in security that the nature of the threats has changed. Gone are the days of script kiddies looking for fame and notoriety; now enterprises face a very sophisticated worldwide fraud machine run by organized crime; with many players, each having their own niche. This system is very adaptable, changing tactics quickly to outwit any attempt to foil their operations. -- RSA report "Charting the Path: Enabling the 'Hyper-Extended' Enterprise in the Face of Unprecedented Risk"
we only used publicly available information, and ended up discovering, based on that information, that the randomness [used in assigning SSNs] is effectively so low that the entire 9 digits of an SSN can be predicted with a limited number of attempts. -- Alessandro Acquisti and Ralph Gross of Heinz College, Carnegie Mellon University. One lesson we can draw is that what was once thought to be secure (or secure enough) is no longer (or not enough). The other lesson is that we need focus mitigating the risks created by the types of fraudulent transactions that are often based on easy-to-obtain credentials like SSNs (see Bruce Schneier's article in Forbes). Most business leaders, especially in business units, and in the legal office, just assume that all storage locations for PII are known and that there is a 100% complete inventory for it somewhere. Infosec, IT and most privacy practitioners know the real deal; it is rare that PII is formally defined, and even rarer to have an inventory of all PII. Considering the ease with which PII can be copied and distributed literally thousands of times with just one press of a button, and stored in any number of mobile devices and outside storage locations, it is very hard to have a complete PII inventory. But, it must be done. And doing so will help to determine the controls and other safeguards that need to be placed around PII to keep from having it stolen, leaked or lost. Rebecca Herold, The PrivacyProf, blogging about the news that the University of Central Missouri didn't know that two printed reports (w/ 7,000 student names, SSNs, addresses, and birthdates) were stolen from a location on campus. I have had similar findings in many of the information security assessments that I conducted in that management was often shocked to hear about the various sources and destinations of sensitive information throughout an organization. Until an organization traces the flow of sensitive data generated and consumed, management cannot hope to have an accurate inventory that data, its location, or whether it has been properly disposed of. In a typical company where risks are a-plenty, and IT is up to its eyeballs in delivery issues it's a little difficult to suddenly step in and talk about security vulnerabilities like they're somehow more important than the 10,000 things that are already on fire. When the whole forest is on fire... which tree do you save first? In the fast emerging cybercrime industry, hackers and scam artists morph and advance magnitudes of order faster than the banking and tech industries have been willing to shore up basic security. From corporate America's point of view, convenience and speed are the drivers of the business models of the new millennium. Security is a perception challenge. I highly recommend this book to anyone charged with safeguarding data. It will open your eyes to a system of actors (banks, credit bureaus, scammers, drug-addicts, and malware authors) revolving around maximizing profit at the expense of the consumer. The book links the murky world of the "exploiters" with the ingenious capacity for "expediters" to generate new and better malware, while the "enablers" sit mainly idle, unwilling to commit to much-needed enhancements to secure consumers' financial records and credit histories. As security professionals, we must engage in critical evaluation of the risks to the data we are entrusted with. This book is sure to generate many lively discussions among security pros, and one would hope, executive management, about the nature of the threat, the drivers, and the baseline security that ought to be implemented.